Stage Hire UK have a range of raised and levelling stages and modules for sale, long term rental / hire in the UK and Europe. Raised and Levelling Stage systems: are the ideal solution for those events that are a little bit different as in the stage is being erected on a hillside, rough ground etc. What this system is also ideal for and is becoming more and more popular is things like when a marquee is built over a stream. These stage systems can be used to create a bridge from one side to another. 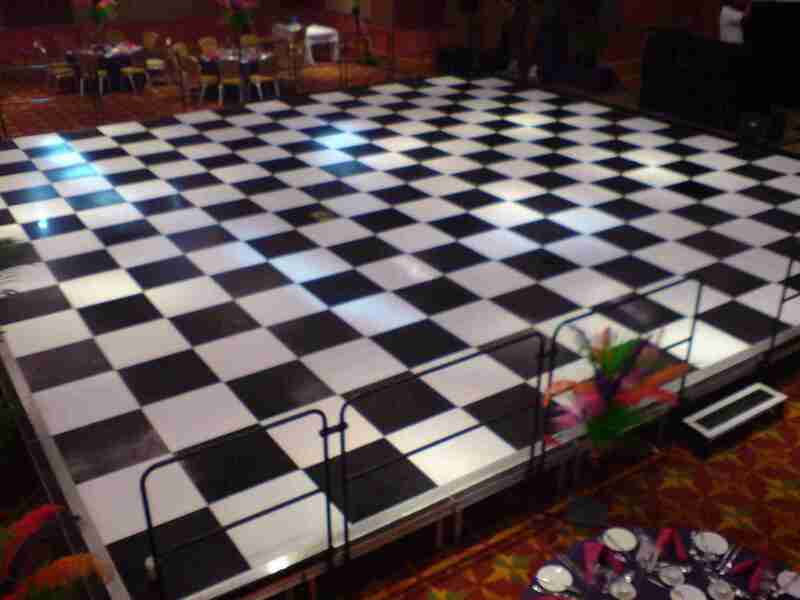 They can also be used for building a raised stage area for the head table to be placed on, to raising a stage over a swimming pool to even lay a dance floor on. Please click here for dance floor information. We can also use our Clear Decks over things such as a stream, then use lighting to high light the flowing water and surrounding area. Then of course as you walk over the clear bridge the effect of the lit water is spectacular underneath your feet. As like all our stage systems now we can build pretty much as size and height system. The width and depth of the stage just needs to grow in 500mm (20") increments in both directions. The height climbs in 200mm (8") increments. All of our stage systems for hire or fully compatible with each other so you can Pic 'n' Mix your stage designs to include standard stage decks, to the pearl stage decks to LED stage systems. Contact us today at Staging Hire UK for further information on our rasied Stages.